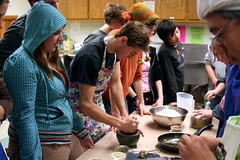 We had a cooking class with teenagers from The Key, a youth-run community-based organization. 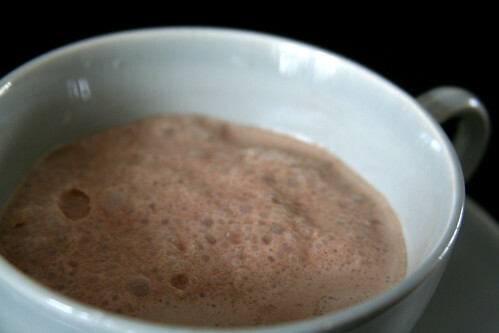 The common ingredient was Mexican chocolate — which we prepared as Champurrado, a hot drink, slightly thickened with corn masa. Here is the Champurrado recipe. and a luscious chile sauce called Red Mole. In the picture, it is served with roast turkey. Here is the Red Mole recipe. 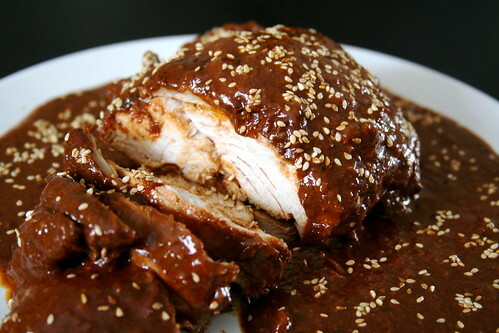 Traditionally, the meat is slowly cooked (braised) in the mole for about 1 1/2 hours. But to fit into our 2-hour class schedule, we roasted free-range chickens instead. 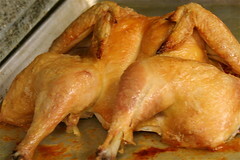 Here is the Roast Chicken recipe. Unfortunately, we ran out of time to prepare a Hot Fudge Pudding Cake, a fun dessert with a brownie-like layer that floats on a pudding-like chocolate sauce. 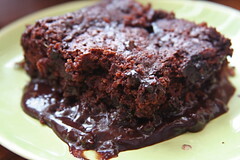 Here is the Hot Fudge Pudding Cake recipe. Sweet Lou, a new waffle shop just opened in our town. Predictably, Andi, Alyssa and their friends have taken an interest in waffles. For the times that we can’t hang out in the new cool shop, we make them at home. 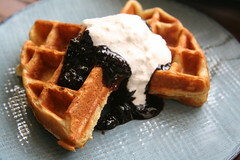 Pictured is a topping of blackberry preserves and crème fraîche. 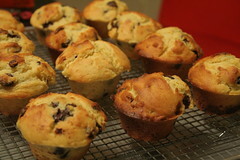 An officemate asked me “How do you make muffins rise?” I consulted the reliable Cooks Illustrated and found the following advice: “Make enough batter to fill up the cups for big, shapely muffins.” Here is a Lemon Blueberry Muffins recipe that shows the trick. 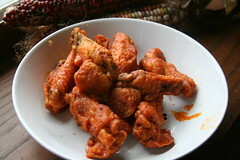 Buffalo Wings prepared with free-range chicken make compelling appetizers. This American classic is baked in an unusual way — in a cold oven set at 225Â°F for 20 minutes and then at 325Â°F for 30 to 40 minutes more. The result is a very moist cake. We served this cake at home last night to a party of teens and grown-ups. Every piece was consumed with delight. Here is the recipe. Today, we cooked rutabaga with sautéed onions in homemade vegetable broth, pureed the rutabaga and onions, and then enriched the soup with cream. The soup was flavorful and light, a welcome treat on a rainy day.